Beat the eggs and oil into the milk and add to the dry ingredients, mixing with a spoon to bind them together. Work the ingredients together into a smooth ball and then turn out on to a floured work surface. Roll the dough out to a thickness of just over 1cm (1/2in). Flour the cutters and use the larger one to cut out rounds of dough, then cut out the centres using the smaller cutter. Re-roll the trimmings to make more doughnuts. Put the doughnuts to one side and make the coating. Mix the cinnamon into the sugar in a small bowl. Now cook the doughnut rings 2-3 at a time. Place the rings carefully into the hot oil and cook for 3-4 mins, until golden on the bottom, then turn them over and cook for a further 2-3 mins, until they are an even golden colour and cooked through. 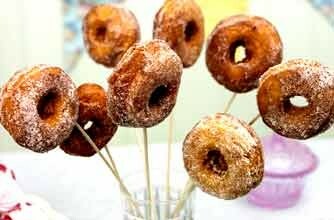 Lift on to kitchen paper to drain briefly and, while they’re still hot, toss them in the cinnamon sugar until evenly coated. Shake off any excess and pPlace on a wire rack to cool. (Not suitable for freezing).